In 1949, the Governor of Xieng Khouang was Chao Saykham Southakakoumane. There were two deputy-governors: one Hmong and one Lao. The first Hmong deputy-governor was Phagna Touby Lyfoung, who was succeeded by Youapao Yang and, in 1975, by Mua Chia. The Lao deputy-governor was Thongsavath Vongsavanthong, who was succeeded by Chao Khong when Mr. Thongsavath was named governor of Pakse Province. Chao Khong was succeeded by Khamsing and, in 1975, by Bounchan Vouthisisoumbath. (Both Mua Chia and BounChanh were resettled as refugees in France). Over the years, several people served as Xieng Khouang representatives for fixed terms. The Hmong representatives included Toulia Lyfoung (elected in 1947), Tougeu Lyfoung (elected in 1951), Touby Lyfoung (elected in 1958), and Touyia Lee (the last one before the communist take over of Laos. The last elected representatives from Xieng Khouang Province were Ly Tou Yia (a Hmong who died in France), Bounthanh (a LaoTheung who died in France. ), and Chao Sopsaysana Southakakoumane (a Lao refugee to France where he died on March 16, 2009). In 1949, when Touby picked Youapao as the Muang Hmong district chief, Bichou Lo became unhappy and decided to change side and go and work with the Pathet Lao. Bichou Lo felt he was much better educated than Youapao Yang, did not like Toulia Lyfoung for personal reasons, was unhappy because his father got jailed in Muang Kham, and got very little support from his relatives most of whom were on the Pathet Lao team. His father was put in jail because, as a Tasseng (county chief), he mismanaged the tax collection system by not implementing his Chaomuang’s instructions. As tax payers did not have the money to pay taxes, his father made advance payments for them and later came back to recover his advance payments. The Chaomuang deemed this was illegal and put him in prison. These were the reasons for Bichou Lo’s desertion in 1949. However, in the end, Bichou Lo came back to Touby’s camp in 1957 when the Lao factions were at peace. On March 9, 1945 the Japanese troops entered the town of Xieng Khouang, arrested several French colonial employees, and closed the local schools. At the time, I was still a student along with other classmates that included, as far as I can remember, Lytou Lyfoung (Phagna Touby Lyfoung’s brother, the future Public Works chief engineer of Savannakhet), Khampheui (a native of Muang Xieng Dett, the future Public Works chief engineer of Pakse), and Khammeung Tounalom (future medical doctor). One day, after the school term, I and one of my friends, Bounta (a native of Ban Na Ou, Tasseng Xieng, 5 kilometers away from the town of Xieng Khouang) made a trip by foot to Lath Houang. We left Xieng Khouang at 8 a.m., went past an unknown Hmong village, and headed toward Muang Kha. After a 5 kilometer walk, once we realized that we were on the wrong trail, we back-tracked and took a different route that led us to Muang Kha, where we arrived at 9 p.m. The next morning, we left Muang Kha and walked along the highway between Nam Hoy Nou and Bouak Kob. When we reached the highway, we saw military vehicles on the road, carrying scary and fully armed French soldiers. At the time, the Japanese have not yet seized the French camp of Khang Khay. We continued our trek until we reached Ban Chom Thong and then Ban Tong, near Muang Kham (which was still Japanese free). When the Japanese troops first arrived in Muang Kham, 300 of them were temporarily stationed at Ban Tong, with about 15 to 20 of them staying at my house. This Japanese battalion was building the road toward Houaphan Province, using French and Moi Kouang Toum prisoners for ground digging on the Ban Bane to Sop Lao-Nam Neun stretch. The road construction, including ground digging and tree cutting, was a truly cooperative effort where everybody regardless of rank and status contributed to. There were no slaves, no bosses. Soldiers and officers alike were part of the labor force. Good discipline was strongly enforced; people worked and ate together. Local villagers were not disturbed; and there was no discrimination toward women. Those who crossed the line were punished, e.g., they had to stand in front of the officers and be subject to body punishments commensurate with the severity of their wrongdoing. This battalion was in place for about three months, until the Japanese surrendered in 1945, following the dropping of the US A-bombs. The Japanese stopped the war and went home through Vietnam. Seven Japanese battalions retreated from Houaphan Province and headed toward Vietnam and ultimately Japan. Each of them stayed overnight at Ban Tong, one battalion at a time. Each night during those seven days, some 20 Japanese troopers spent the night at my house. All of them were very disciplined and well-behaved. In 1946, I took part in the creation of Muang Phonesavan. At the time, I was serving at the district office at Houei Kham, a Vietnamese village located between Khang Khay Camp and Phonesavan. The Chaomuang of Muang Perk was Thao Khampheng Thongkham, and then Thao Van Tanovan. The latter was the district chief that led the administrative officers and the local residents in clearing up an old forested area in Tasseng Kat and started building the current town of Phonesavan. Once the new town was ready, the Muang Perk district office was then moved from Ban Houei Kham to Phonesavan. Before deciding on using this name, Chaomuang Van Tanovan recommended several alternative names to Chaokhoueng Saykham. The Chaokhoueng officially wrote back, “You are Thao Van, the town you created should be named Phonesavan.” Therefore, from 1946 on, the new town was called Phonesavan. (Mr. Van Tanovan and his family resettled in Portland, Oregon, USA. Very few people of his age are still alive today. For that, he was indeed very lucky). Photo #96. Nhaluang Bounchanh Vouthisisombath, deputy-governor of Xieng Khouang Province and his wife. Photo taken in 1997 in France. Photo #97. District Chiefs of Xieng Khouang Province in 1972 (photo taken on September 30, 1972). Front row from left to right: Samingkham Aphayvong, Ouy Chanthivong, Mua Yeu Noutoua, Yang Dao, Bounchanh Vouthisisombath, Douakham and Phomoune. Back row from left to right: Xao Chiay Thao, Neng Thong Lee, Youatong Yang and Ly Xiong. On April 12, 1953 the Vietminh deployed three divisions to invade Laos for the second time. Division 312 attacked French troops between Samneua and Louangprabang; Divisions 304 and 306 attacked Xieng Khouang to destroy the Plain of Jars airport; and Division 308 attacked southern Laos. This led to severe losses to military camps in Houaphan Province and forced the troops from northern Laos to retreat in the jungle and find some ways to get to the Plain of Jars. The Plain of Jars became a strong French military camp that was set up to control the Vietminh’s invasion. Not long afterward, French Foreign Legion troops, consisting of soldiers from the Arabic countries of Morocco and Algeria, and South-Vietnam also came to the rescue. Once they arrived at the Plain of Jars, the Vietminh army started its attack but was not able to seize the camp because the area was very flat and aircrafts were dropping flares all night that identified exact enemy’s positions. The Vietminh then moved their troops on Highway 4 toward Xieng Khouang, with French troops on their tails until they reached Dong Darn area. The Vietminh stayed between Dong Darn and Xieng Khouang for less than a month before they were pushed away and retreated toward Sanh Noi/Thaene Phou. In 1953, once Xieng Khouang was recaptured, I stayed there for 10 days before returning to the Plain of Jars to be with the South-Vietnamese battalion and the Hanoi parachutist battalion. Ten days later, I was reassigned to the French Foreign Legion contingent under the command of Capt. Max Blin. The contingent was deployed from the Plain of Jars on foot, and spent the night at Ban Khang Mone. The second day, we walked along Highway 7 past the Tat Peub Falls and were ambushed by the Vietminh at at narrow and steep section of the road, near the diversion to Ban Dene Dinh, about 11 kilometers north of Ban Bane. The fighting last for about an hour before the enemy retreated toward Ban Bane. One battalion (the French Foreign Legion contingent under Capt. Max Blin’s command) to which I was assigned, approached Ban Bane from the middle road along Highway 7. The troop movement was under the constant air surveillance of a small Moral airplane. When there was a fighting, B4 and T4 black and very fast one-engine aircrafts were there to drop bombs and fire on the enemy. Sometimes, B26 airplanes also joined the air attack, flying in four at a time. It took fifty days to liberate Ban Ban from the Vietminh. Before entering Ban Bane in May 1953, I used to tell Capt. Max Blin at Tat Peub that, “Our people out here live by themselves, away from the Vietnamese. By and large, they would not want to be with any Vietnamese.” After chatting about this and other subjects with me, Capt. Blin told his commanding officers by radio and by microphone, “Before we enter the town, make sure to tell your troops not to get into people’s houses. Don’t take anything from them, not even a single fruit because their leader is here with us. From 1953 to 1954, the French battalions stationed in Muang Kham behaved themselves extremely well, did nothing to harm the local citizens, raised not a single complaint, and maintained an excellent relationship with the public. Members of the French Foreign Legion came from several countries, such as Italy, Germany, Algeria and Marocco. None of them was allowed to be ranked higher than an “Adjudant-Chef”because they were treated like mercenaries. All the officers higher than an “Adjudant-Chef” had to be French. After recapturing Ban Bane, several French regiments returned to the Plain of Jars, leaving only the French Foreign Legion contingent in Ban Bane, with the mission to fortify the Sam Phou camp and to cleanse the Vietminh between Ban Bane and Phak Khaer. This contingent stayed in Ban Bane for a year, and was later sent back to the Plain of Jars to get ready for deployment to Dien-Bien-Phu. It was replaced in Ban Bane by Battalion 6 of the Royal Lao Army under the command of Maj. Bounleuth Sanichan. Before the Vietminh attacked the Plain of Jars in 1953, I was recruited in the military rank and sent to Vientiane, supposedly to later attend the Officer Training School in Pakse. For some reason, I did not get to go to Pakse and, instead, was sent back to the Plain of Jars to serve as an aide to the French Foreign Legion contingent stationed there. Five other individuals were with me at the Plain of Jars, including Sattasinh (Ms. Mou Soua’s husband), Col. Bounnoi Noymani, Kongsadeng (a teacher and the son-in-law of Mr. Louis Lescure), and another person whose name I forgot. I served with the French Foreign Legion in Muang Kham for a year before Muang Kham was captured by the enemy. During the retreat from Muang Kham, I served as guide to the French regiment under the command of Capt. Rebour and Roland Selbe (the brother-in-law of Chao Saykham and the husband of Chao Phengdi) and took them up to the Phou Sanh mountain range. We spent the night at the Hmong village of Ban Ham Kheu, near Ban Bouam Long (the village of Mr. Jeupao Moua) and, the following day, descended to Ban Nalam and walked our way to the Plain of Jars. In 1953, I took my family to seek refuge in Hanoi, making that trip along with Phagna Touby’s family. Capt. Max Blin warned me before that, “The Vietminh will attack the Plain of Jars in 1953. They will attack all the strategic roads and all the airbases.” He said it would be wise to put my family at a safe place for a while. On the day I was supposed to come back to the Plain of Jars from Hanoi, the Hanoi’s airport was attacked by the Vietminh. I saw French tanks moving around the airport. Upon my return from Hanoi, I rejoined the French forces and participated in the reoccupation of Ban Bane. Shortly afterwards, Vietminh troops deployed from Tham La caves were poised to attack the military camp in Ban Bane, coming from Ban Chior and Ban Xieng Khoune. However, they were ambushed by the allies’ Battalion 6 at Tat Peub Falls and Ban Xieng Khoune, had many soldiers killed in action, and were forced to retreat back to the Tham La cave. After this failed attack, the entire French Foreign Legion’s Battalion 6 moved out of Ban Bane and was replaced the Royal Lao Army’s Battalion 6. In 1955, I traveled to Bangkok, Thailand and met with a Lao delegation headed by Mr. Oun Sananikone. He took a group of village and Tasseng elders, including tens of Hmong natives of Xieng Khouang, on an observation tour of several sites in Thailand, looking at rural development projects. From Bangkok, we visited Ayouthaya and Lopburi. While in Lopburi, we were told that many residents of that province, in Ban Mee District, were mostly the Thai Phuans who came generations ago from Xieng Khouang and still spoke with a Lao Xieng Khouang accent. Back in Bangkok, Gen. Phao Srianon, Minister of the Interior of the Royal Thai Government, invited us at a dinner at the Erawan Hotel in honor of the Lao visitors. 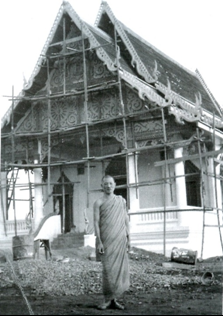 In 1957, Prince Tiao Phetsarath returned from Thailand and went to visit Muang Kham. The Chaomuang of Muang Kham, along with his staff and the district elders, gathered together and held a welcome and well-wishing party for him at the Chaomuang’s office. That same year, a Vietnamese delegation came from Hanoi to negotiate border issues at Ban Nam Kanh, Muang Nonghet. The negotiation was fruitless and had to be rescheduled in Hanoi. In September 1957, the delegates met there for several days, but did not reach any agreement –just the agreement to meet again sometime in the future. I have kept the documents on the border negotiations in my files until the day I left the country. I have forwarded the photo of the Lao and North-Vietnamese delegation, along with the document that nominated them and the map of the contested border area, to Gen. Vang Pao in the USA via TouXoua Lyfoung (Touby Lyfoung’s son), when he went to the USA for Phagna Tougeu Lyfoung’s funeral in 2004. In November 1957, I attended a meeting of the World Youth Association in Tokyo, Japan along with H.E. Chao Sopsaysana, H.E. 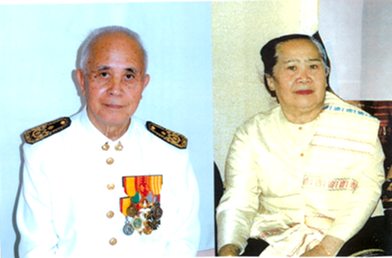 Inhpeng Souryathai, Mr. Pha Pholsena (a Ban Keunh’s native), Tiao Sisa Ngouane (the wife of Pol. Gen. Vattha Phanekham), Mr. Bounketh, and Mr. Thao Ngo (President of the Vientiane Chinese Association). We flew from Vientiane to Saigon and then to Manila, The Philippines, where we stopped over for a short while. I was sitting on the same seat row as H.E. Inhpeng Souryathai on the flight to Tokyo. On August 9, 1960 Capt. Kong Le staged a coup d’état in Vientiane. At about the same time, the Chaokhoueng of Xieng Khouang was taking H.E. Bouavan Norasing on a trip to Muang Kham. After they overheard Kong Le’s coup d’état announcement over the radio, they then decided to hurry back home. Vietnamese communist troops moved in from Tham La cave. When they arrived at Ban Chor, Ban Ban Xieng Khoune, they began heavy artillery fire on Muang Kham. The allied troops did not know what to do because the attackers were firing from all directions. They then chose to retreat toward Muang Thae and then to Muang Phan. Before the communists attacked Ban Bane, Gen. Vang Pao and I led Hmong troops from Xieng Khouang to fight the Vietnamese and Pathet Lao in the flat area north of Ban Bane, near the road to Ban Kang Na and Ban Sop Ma. When I heard about the Kong Le’s coup d’état and asked Gen. Vang Pao about it, he told me, “Kong Le will come to Xieng Khouang for sure!” He had trees cut along the highway and disposed of them across the road to prevent traffic movement. But when Kong Le retreated from Vientiane, he was still able to easily bring his troops to Muang Soui and seized successively Ban Bane, Muang Kham, the Plain of Jars, and Xieng Khouang very easily. I left Muang Kham in the company of a military construction unit under the command of Lt. Oneta Phanivong. From Ban Ban, we spent the night in the forest up in the Muang Therr mountain range and then continued uphill in the direction of Ban Pha Phaat. We ran into Battalion 23, under the command of Capt. Ka Viphone, which was retreating from Samneua and Tham La and heading toward Muang Kham. From Ban Pha Phaat, I joined the regiment commanded by Lt. Nengcheu Thao and Lt. Ly Naokao at Ban Tha Lin Noi, and moved out with them at night to enter the highway between Dong Dane and Ban King, and headed toward Phou Khae. From Phou Khae, we walked across the plain around Ban Pha, and headed up toward Ban Khang Khay (Chaomuang Youatong Yang’s village). Once we reached Ban Khang Kay, Gen. Vang Pao sent a HT-34 Helicopter to fly us to Padong LS05. At Padong, we led villagers in building an air strip. Once the air strip construction was over, I informed Gen. Vang Pao I was going to go to Vientiane and then to Savannakhet to meet with the governor of Xieng Khouang. At that time, the Xieng Khouang provincial office was temporarily located in Savannakhet, right behind the Savannakhet provincial office. I stayed in Savannakhet for several months, and had a chance to gather the payroll records of Xieng Khouang administrative personnel. I actually went out to pay salaries to all the Xieng Khouang administrative officers working with the lowland Lao Battalion under Col. Chansom Pakdy Monivong and stationed at Phou Pha Khao, Xieng Khouang Province. After that, I came back to work at the Xieng Khouang temporary provincial office at the Department of Interior in Vientiane until 1962. That year, I rejoined Gen. Vang Pao at Long Cheng to make arrangements for the election of Xieng Khouang representatives. The General let my family and I stay in a house in front of his Long Cheng’s residence. In 1963, Chaokhoueng Saykham delivered the document that he wrote in French on the history of the Muang Phuan to Mr. Archambault in Bangkok. In 1965, after Gen. Vang Pao completed the construction of Samthong, I moved in there from Long Cheng. I moved to France in 1976. Chao Sayasouk Southakakoumane (Chao Saykham’s son), who studied in France, showed me Chao Saykham’s document on the history of Muang Phuan and a tutorial book on oriental culture compiled by the Ecole d’Extreme Orient (Far-East Institute). The tutorial book went as far back as Chao Chetchieung and his son Khoun Boulom, who came from Muang Thene in the 7th or 8th century to establish the Muang Phuan princedom. I found out that the book contains several pages of Lao quotes from Chaomuang Thao Phane of Muang Kham, as excerpted from the letter he wrote to Prince Phetsarath on the same subject. Photo #98. 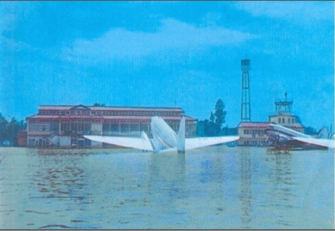 The Vientiane’s Wattai Airport under flood water in 1966 — –an omen that the situation would get worse and that many changes would take place in the country. When I was stationed in the Samthong-Long Cheng area, each time Gen. Vang Pao visited a military camp, he would almost always take me along with him. I saw him fire artillery quite a few times. In 1966, we went to Ban Hai, near Ban Kang Na and Ban Houa Na (Sopna), a flat area around Ban Bane, right before the North-Vietnamese and the Pathet Lao seized Muang Kham and Xieng Khouang. We visited the battle field of Tha Vieng –Ban Kieo Manang, Muang Omm–, Tha Vieng and Tha Thom –headquarters of Regiment 13 which, under the command of Col. Chansom Pakdymonivong, just occupied the town. We went to Muang Ngarn and visited the important base at the top of the Hom Chong Mountain overlooking Muang Ngarn. We went to the battle field of Houa Muang and the Phou Thong Lott Mountain, near Kiew Famut, where our troops were stationed before they seized Kiew Famuth. We stayed in Na Khang and then went to the Plain of Jars, Lat Houang and Phongsavan. When we were in Lat Houang, we climbed the nearby mountain top overlooking Ban Na Nou. When our soldiers saw the North-Vietnamese troops running across the village, they fired artillery in the enemy’s direction. Pretty soon, the enemy fired back. Fortunately, their shell hit a tree near where we were standing. Had it not hit that tree, one wonders what would have happened to us. This was really a sign of miraculous protection provided by the angels. In 1966, the year Vientiane was flooded by the Mekong River flows, we visited the construction site of the future Nam Ngum Dam, as well as other similar dam sites in Thailand. Following a favorable site inspection by the Japanese experts, the Chaomuangs from all over the Lao kingdom paid a visit to the site of the dam to be built on the Nam Ngum River. Material excavated from the ground was stored in a big building at the dam site. In Thailand, we went to the site of the already completed Oubolrat Dam in Khone Kaen Province. Following that visit, the Thai authorities invited all the Lao guests to stop by at Ban Xieng, a village where Thai Phouan refugees were resettled after being forced out of Xieng Khouang before Khone Kaen Province was created. Upon our arrival, local leaders, elders and Ban Xieng residents offered a splendid Baci welcoming ceremony, complete with flowers and candles and floor cultural dances, to the visiting Lao Chaomuangs. After the Baci ceremony, the host elders confided that they were descendants from Phuan immigrants and said they were not sure how they ended up there. But once they were here, they wasted no time rebuilding their lives and living conditions, forging friendship, taking care of each other, and setting the base for trading and commodity exchanges. They said they did not practice the same exchanges with residents who moved in from other areas, did not know them and, in the end, could not stay on for those reasons. The Ban Xieng residents grew mulberry, raised mulberry silkworms, and worked together very well as a closely-nit team. After the visit to Ban Xieng, we went to the office of the Governor of Oudorn Province. The Governor gave the Lao Chaomuangs an one-hour briefing on his province’s agriculture, cattle rising, social development, and natural resources programs. He then took them to the national library, a newly-completed 7-story building in Khon Kaen Province. The tour guide explained that this library had to be able to store at least 1.2 million books to cover all the needs. At that time, only 600,000 books were in the library. Before the Baci ceremony, Mr. Lo Khamthi had the opportunity to ask Prince Souvanna Phouma a question at Chaokhoueng Saykham Southakakoumane’s residence. He said, “Your Highness, I’m concerned about our country since you and your brother have brought in North-Vietnamese to fight a war in Laos. After the war, I’m afraid we will never have enough time to fully replay them with our blood. What do you think?” Prince Souvanna Phouma answered, “Don’t worry. I have already talked with North-Vietnamese Prime Minister Pham-Van-Dong. He told me that once the Americans leave Indochina, the North-Vietnamese see no further need to keep their troops in Laos. That’s what he said.” Mr. Lokhamthi reacted, “Nothing to worry about, really? Your Highness, when our rice crops are ripe, please do not let the North-Vietnamese come in and pick them up!” Prince Souvanna Phouma remained speechless. After the North-Vietnamese seized Samthong, the Governor’s office was relocated to the mouth of Pak Meuy River, a tributary of Nam Ngum River. I got malaria fever that last for several months and almost took my life. One night, I stayed at Gen. Vang Pao’s residence and tried to get an intravenous antibiotics shot from Dr. Khammeung. The doctor told me that malaria can never be cured regardless of how much drugs I am taking, because its germs are deeply entranched in my body. The only way out is through infusion of salt water and repeated injections over several days to allow salt water to seep through the whole body and kill all the germs. Another guest at Gen. Vang Pao’s house was Mr. Thip Thammavong, the father-in-law of Mr. Tougeu Lyfoung. That same night, the enemy came through the Phra Rassavang Mountain and fired mortar shells to Long Cheng. Aircrafts, flying in from an unknown spot, also dropped some bombs over the area between Long Cheng and Nam Ngoua, and caused several fatalities among the population in 1971. In 1973, I was admitted to Mong Kout Kao Hospital in Bangkok, Thailand, along with Col. Khamhoung Pravonviengkham, who was there for intestinal disease treatment. Gen. Ouane Ratikoun, Commander of the Royal Lao Army, was also there for kidney stone surgery. He said the stone was the size of a small finger tip and that this was his third kidney operation. This was the same year when Gen. Thao Ma and Col. Bounleuth Saycocie dropped bombs on Chinaimo and Phon Kheng camps in August. Gen. Thao Ma was caught and killed following the air raid. The on-going negotiations between the communist and the Vientiane factions ran into several problems and caused the Vientiane faction to distrust the communist faction. Because the half-Vietnamese Lao leader Kaysone Phomvihane brought thousands of communist troops into Laos, the Vientiane faction had to ask Gen. Thao Ma and Gen. Phouma Nosavan to set up a coup d’état. This was made without the knowledge of MR-V Commander, Gen. Kouprasith Abhay, who then put up a strong defense because of previous episodes of conflicts in 1965 when he himself organized a coup d’état and forced Gen. Thao Ma and Gen. Phoumi to flee to Thailand. The 1973 bombing was the second air operation Gen. Thao Ma performed. This time, he could not escape; his plane was shot down and he had to make an emergency landing, got arrested and was killed on the spot at the Wattai Airport by Gen. Kouprasith. This event might have played a role in Gen. Bounpone Marktheparak’s decision not to leave the country. He was eventually put into jail by the communists and died under extremely excruciating conditions at the Vieng Xay re-education camp. Gen. Vang Pao and Chaokhoueng Saykham were both great leaders who understood and were sensitive to each and every need of the population. They implemented assistance programs that allowed their constituents to become self-sufficient, get some education, stay well-informed, have a good future, and practice religions because religions teach people to be honest. They did everything they could, but their intents were not completely fulfilled because of the political insecurity that prevailed all over the region. This was the day President Nixon, his wife, and selected members of his cabinet visited Peking in mainland China. That same night, Gen. Vang Pao, one US journalist, Col. Tou Fue, several troopers and I flew on a powerful helicopter to the top of Phou Bia to spend the night. I was not quite sure which mountain peak we landed on, but the whole mountain range looked so grandiose and had many summits. The wind was blowing around the clock, even when we were asleep. This was indeed a high elevation spot covered with unfrozen ice. It was so cold we could not sleep, had to keep burning wood to stay warm, and spent time chatting all night with the US journalist. We listened to the radio broadcast from Peking about the reception provided by the Chinese Government, just one battalion of honor troops that greeted President Nixon and escorted him to the hotel in downtown Peking. China did not mount a huge reception like it did for Prince Sihanouk, the King of Cambodia, when he visited China earlier and was greeted by a big crowd of Chinese who threw flowers on the ground in his honor all the way from the airport to the hotel. [Thank you, Nha Luang Bounchanh, for sharing your notes on your personal involvements in the 1945-1975 events with all our younger readers]. The governor of Houaphanh Province in 1947 was Kinim Pholsena, followed in 1949 by Van Tanovan. Chaokhoueng Van Tanovan’s deputy, Khampane Boungnarith, was later executed by the Pathet Lao Communists after they seized Houaphan Province. Later on, Thongsavath Vongsavanthong became the provincial governor, with Champa as his deputy. The situation in Houaphan Province has often been in turmoil as a result of the communist invasion, leading to the nomination of military officers as acting provincial governors, and forcing many military families to move to other out-of-province locations. The first acting military governor was Col. Khamsao Keovilay, followed by Col. Thong Vongrasamy (who died in 1965 while trying to rescue an American pilot who was shot down by the enemy). 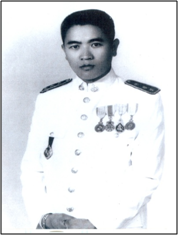 His replacement, Col. Phanh Siharath, was killed in action in 1969. The next acting governor was Col. Boun Noi, with Ounkham Outhaythani as deputy. In 1973, the acting governor was Col. Chansom Pakdy, with two deputies –Sim Vichit Vongsa and Thongsonh Sophamixay. (Thongsonh graduated from the Law School in Vientiane, went on a training program in France, and was assassinated in 1973 at Ban Son for political reason). 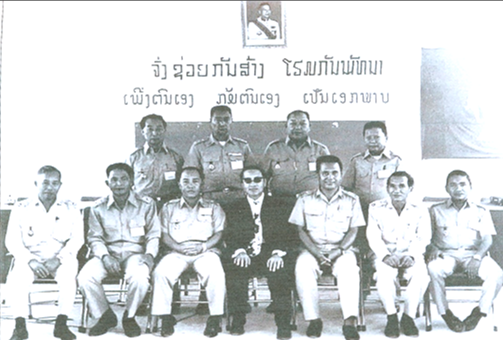 The Police Department was led by Col. Khampheng Sophamixay. Muang Hong Nonh: Lao Thai Va Lue Vang (Hmong). Photo #99. The Buddhist temple built in Long Cheng in 1972 with a golden anchor under the direction of Xieng Khouang provincial abbot, Phra Maha Khamphan Nanthavong (currently living in France, who later brought in a large Buddha statue from Thailand in 1973). In 1975, Col. Phan Ene was the Commander of Houa Phanh Military sub-region until May 14, 1975. Elected provincial representatives were Mua Xeu, Phom Bounlutay and Sim Vichitvongsa. The first Medical Commander was Col. Dr. Khammeung, assisted by Lt. Col. Bounthanh. In 1972, when Col. Dr. Khammeung was transferred to Vientiane, his replacement was Lt. Col. Dr. Bounthanh, assisted by Lt. Nang Leua. Eighty percent of the population living in the territories ruled by Gen. Vang Pao received adequate modern health cares thanks to the US who provided medical supplies and set up the Senesouk Clinic in Samthong – a clinic that was destroyed by the Communists in early 1969. All the medical equipment at the clinic was lost, but the medical staff was safely relocated to Ban Xone-Naxou (LS272) and stayed there until May 14, 1975.